OK, so I know that making tortillas at home probably seems totally over the top and crazy to some people. They are so easy to buy at the store and usually used for quick and easy dinners, why would you increase the difficulty?? And at one point in my life I totally would have agreed with you. But, not anymore! First of all, they are not NEARLY as difficult as I thought they would be. I was so surprised the first time I made them. My food processor did most of the hard work for me. Second, the taste and the texture. Seriously, no comparison. I don’t think I can even accurately describe how much better than store bought tortillas. Third, you can freeze them! If you have a weekend with just a few extra minutes then you can make a nice big batch and place them in a freezer. Then they are still grab and go for a quick and easy weeknight dinner. I’ve tried all butter, all Crisco, a combination of the two, and a combination of butter and oil. Hands down the combination of half butter half Crisco is my favorite. In my opinion, it yields the best texture and taste. A lot of recipes say to roll out all of the tortillas and then cook all of the tortillas. I find that I have the best flow when I roll a tortilla and then cook it, and while it is cooking I start to roll the next one. I use the counter space right next to my stove so I am able to roll and keep an eye on the tortilla at the same time. Of course you’ll just have to see which flow works better for you. It’s important to have enough flour to keep the tortillas from sticking (and this helps them keep a better shape, too!) but careful not to use too much, because the raw flour will start to scorch in the pan. If you think you’ve rolled them thin enough, roll them just a little thinner. You’ll be surprised how much the plump up. In the bowl of a food processor*, quickly process the flour, baking powder and salt to combine. Add the shortening and butter and process in 3-5 second increments until the dough is evenly crumbly. With the food processor running, stream in the warm water and process until a ball of dough forms. Dump out the ball of dough onto a lightly floured surface and lightly knead to form a solid ball. Cover with a clean kitchen towel and let rest for 10 minutes. After resting, divide the ball of dough into 12 pieces and shape into balls and cover with a clean towel. Now you have two options. Option one, roll all of the dough balls into very, very thin rounds, keeping a sheet of paper towel or parchment paper between each one to prevent sticking. Heat a heavy bottomed skillet over medium-high heat. Place each round, one at a time, in the skillet. Cook for about 20-30 seconds or until large bubbles start to form. Flip and cook for an equal amount of time on the second side. Remove from heat, place on a plate, and cover with a clean towel until ready to eat. Option two, heat a heavy bottomed skillet over medium-high heat. While the skillet is heating, roll the first ball of dough into a very, very thing round. Place the thin round in the skillet and cook for about 20-30 seconds, or until big bubbles start to form. Once bubbles have formed, flip and cook for an equal amount of time on the other side. While that round is cooking, start rolling out the second ball dough. 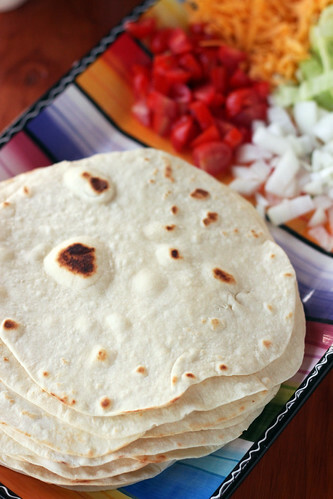 As each tortilla is done place on a plate and a cover with a clean towel until ready to use. Repeat the process until you use each of the dough balls. 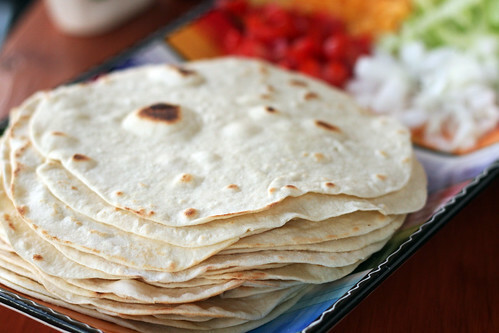 To freeze: Tightly wrap a stack of tortillas with saran wrap. Place the stack inside of gallon freezer bag. When you’re ready to use, remove from freezer and unwrap. Cover with a damp clean kitchen towel and microwave for about 30 seconds (or more) to thaw. *It is possible to make the dough with out a food processor, I have just never done it myself so I don’t have many tips!